I've got baby stuff on the brain right now and as fun and exciting it is to think about, it's starting to get a little overwhelming. From working on the baby registry to working some more on the updated nursery design board (you knew I was going to change it up a bit), I think my brain is on baby-overload mode. Not that I don't love window shopping, but who knew creating a baby registry would take so much time?? And reworking the nursery design board to better fit our budget has been a bit of a challenge to say the least. BUT I have found some amazing new items (sneak peak below) to add/replace to the original nursery design board. This is actually something Steve found and has lobbied a lot for. Since he doesn't like overhead lighting to be a main source of light, a floor lamp is a must in the nursery. The nursery needs some glitz and glamour, so what better way to incorporate those characteristics than through this mirror? 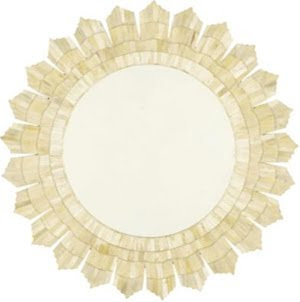 A gold mirror seemed a bit too mature for a nursery, but I think this one fits the bill. Steve's mom has graciously offered to help Steve paint the nursery, so that is the plan for Saturday. I am SO excited to see the room finally painted, and to see the furniture that we have so far go in the room. And don't worry, I'll be photographing the whole process so that you can see the transformation as soon as the nursery is done. BTW, Happy Friday! And Happy Birthday to my dear friend David! i LOVE the floor lamp!